Earlier this week, an Instagram post about Washington, D.C.’s missing girls went viral. Millions of people were moved by the story of 14 teens disappearing in a mere 24 hours. The issue? That stat was untrue. There is a real problem, though. Even though the “14 girls missing in one day” stat was proved false, dozens of girls of color have gone missing in D.C. in 2017. Indeed, HelloGiggles reported last week that 10 teens had gone missing in 10 days, and we also wrote about the celebrities who shared heartfelt posts about the situation on social media. Now, we want to share the latest on D.C.’s missing girls. 14 girls did not disappear in one day. Despite the panicked posts on social media, this stat is untrue. The D.C. police department recently began tweeting out the names and photographs of all missing persons whose cases are considered “critical,” which includes those under age 15 and over age 65; many of the department’s tweets featured the faces of Black and Latinx girls. Previously, this information was shared on a discretionary basis. The uptick in missing person tweets contributed to the social media outcry over D.C.’s missing girls, according to the police department, as it appeared that a sudden rash of girls had disappeared from the streets of the nation’s capital. At present, about 190 juveniles go missing in D.C. each month, The Washington Post reports. That’s on par with other major cities, and down from 200 missing juveniles per month in 2015. The police department says that the vast majority of these young people are found. The girls featured in the viral Instagram post are indeed missing, but some disappeared years ago; a few aren’t even from the Washington, D.C. area. None of the girls were confirmed as kidnapped. Although false reports indicated that the girls had been taken from their homes by force, police later confirmed that all the teens who had gone missing in 2017 had run away. Stories about drug rings and human trafficking have not been verified by any reputable sources. Many of the girls end up in dangerous situations, though, staying with friends or others in unstable situations, and are sometimes forced to exchange sexual favors for room and board. Missing person cases involving people of color are underreported. Disappearances of people of color, and women of color in particular, are often dismissed as runaways, even though that doesn’t make the cases less serious. Even when women and girls of color are confirmed as missing, they rarely capture the attention of the national news media the way missing white women’s cases do. This viral Instagram post illuminated that fact, which in part led to the story going viral. 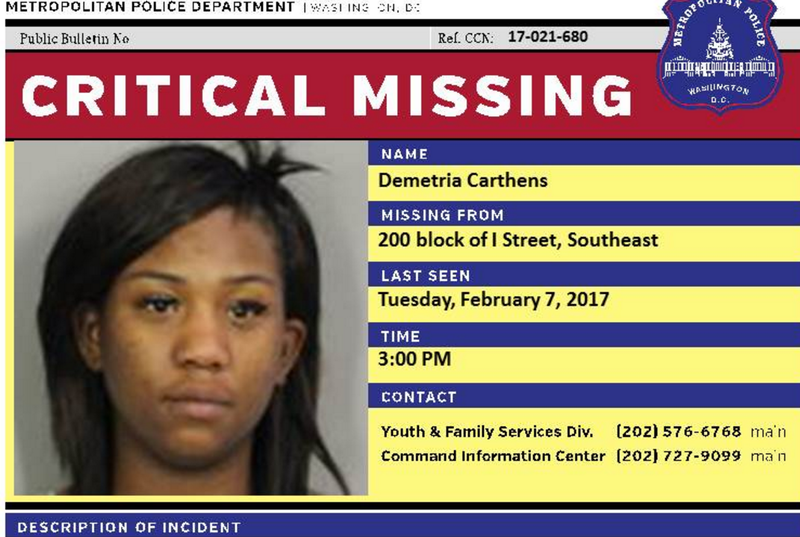 Missing teens in D.C. are still a real problem. While the viral story may have been false, make no mistake about it: Washington, D.C. has a problem with missing teens. The D.C. police have recorded 523 cases of missing youth this year alone — many of them Black and Latinx — and 13 juvenile cases still remain open as of March 26th. Change is coming, though: In response to the outcry following the viral story, the mayor of Washington, D.C. created a task force devoted to finding and supporting missing children in the area. D.C. Mayor Muriel Bowser said the task force will help to determine what social services will help stabilize the home lives of at-risk teens, and allocate funds to nonprofit groups that support vulnerable youth. Bowser’s move follows a letter sent by the Congressional Black Caucus on Thursday calling for the Justice Department to aid local police in locating missing D.C. teens.